Does Billy offer Shorey hint? Probably not.. | Through the seasons before us.. Does Billy offer Shorey hint? Probably not..
Wasn't close enough for a decent snap! In the second half, when it was open to the floor (admittedly moderated by the means of submitting questions on pieces of paper), it was clear that a number of folks in the crowd didn’t really pay much attention to those ground-rules. Davies made it clear he wasn’t prepared to discuss ‘board matters’ but would be as honest as he could be within the terms of his contract. For some people that didn’t seem to be good enough. Anyway.. enough of my babble – these are the highlights as I’ve been able to glean from my memory and with no small help from the helpful Twitter stream of @Dazzler_m who kept up a running commentary throughout proceedings, which was more than I could be bothered to attempt! He started by reminding us of the huge amount of credit our team (and supporters) deserved for last season’s efforts – a number of times he used terms like ‘overperformed’ which would suggest they perhaps exceeded his expectations somewhat. He reminded the fans of that patience is a virtue – that we started slowly in results terms last season (but not performance levels) and the fans backing really helped. When quizzed about signings, he was at pains to point out that the acquisitions, sales and loans of players were not his decision – his role in the acquisition panel was an advisor and recommender. He let slip that the other members may have their own targets in addition to those he puts forward, he also clarified that he advises on potential outgoings as well as incomings. Billy underlined that he was aware of the system that Forest have in place, and that then – and now – he is supportive of it as a notion, given the financial situation at the club. It is the chairman’s money to spend, and Billy is very much in the position of working with the resources he is provided – he claims to be happy with this situation. He pointed out obviously he will always want improvements that might not be forthcoming. Nicky Shorey was a popular topic of conversation, and when his name was first mentioned Billy muttered ‘… is a Red’ under his breath (ape-ing the ‘Billy Davies is a Red’ chant that had been doing the rounds) – which is naturally being leapt upon as a massive hint. I’m not so sure, although obviously I bloody hope it is! Billy clearly rated Shorey’s ability and impact on our squad as highly as many of us do. When Fletcher likened the current situation to the Paul Hart post-playoff season Billy dodged it, understandably – he pleaded ignorance on Forest at that time (fair enough), and reiterated his pretty well scripted view on Forest’s acquisitions policy. Certainly people who were at the last Davies night noted a much more guarded and – I’d say professional – Billy Davies than the man who was present that evening. The main final topic of conversation was around the press – now rumours have been in overdrive lately, and Davies quashed any suggestion that (a) he was about to quit, (b) he’d been given a warning or any disciplinary action or that (c) Kelvin Wilson was on strike over wanting to move to Celtic. He later went on to state that he’d never had any cross words with either Mark Arthur, Nigel Doughty or the rest of the board – and spoke of his respect for all of them. He was very animated about the press, bordering on paranoia. He was at pains to point out he only has one advisor – a lawyer – who has not been talking to Celtic, nor has ever had any dealings with Forest beyond the initial dealings to sign him up. He reiterated to fans not to believe these rumours – and pointed out that certain teams not too geographically far from us would be delighted at the thought of a fractured dressing room or disharmony in the backrooms at Forest. I can understand the slight frustration that was in the room, but personally was glad to see Billy behaving professionally. For a couple of fans this spilled over into heckling which visibly pissed off the wee fella – I can see why, too. He’d laid out what he was and wasn’t prepared to discuss, but seemingly that wasn’t good enough for some people who made their feelings plain – which was a pity, but kinda inevitable as anyone who’s been to any of these nights would no doubt attest. One of the few names discussed was McGoldrick – the question was actually around how he got his injury, but Billy took the opportunity to have a bit of a soapbox moment – and all credit to him for it. He compared him to Diego Forlan’s time at United, roundly derided as a poor signing – but now on the back of a fantastic World Cup. He stated that McGoldrick a player that many Forest fans will owe an apology to in the future – I believe he’s right, too – I see great potential in the lad. Another scapegoat mentioned was James Perch – he said that as a former captain of the club (albeit in an acting capacity) fans should show a little more gratitude. He pointed out what probably most right-minded Forest fans realise which is he was a tremendous worker, perhaps with limited ability – but a real grafter and who was a pleasure to work with and have in the squad. Sentiments that sound very akin to my parting story about him! When asked about Forest’s general communication with fans Billy wouldn’t be drawn, citing it being company policy – this lead to Fletch offering the tantalising suggestion of an Evening with both Mark Arthur and Billy Davies. Billy was animatedly supportive of this idea – Fletch said he’d make the calls to see if it could happen, although this was before the heckling which might well put Billy off future appearances. A fairly innocuous question around commitment seemed to prickle him immensely – a number of times he passionately spoke of his desire to move Forest on as a club, to him anything less than the play-offs next season would be a disappointment, and a number of times he invited the room to come down to training to see how committed he, his team and his players are on a day to day basis. More specific questions included which one player would he sign if he could – he chose Nicky Shorey, his career highlight to date which was saving Forest from relegation. Whether or not there is a wage cap in force at the club at present – there isn’t, and would he sign a new contract with Forest – without doubt yes, but a contract would have to be offered. He was quite pointed about this! I missed the first Billy Davies night – but certainly this time he has either decided – or been told – not to talk about certain areas as openly as he may have last time. I don’t like to try to speculate but sometimes one got the impression more was being said than literally – if you read between the lines – but to try to interpret that it makes me no better than the media outlets that seem to get a buzz from putting words in Billy’s mouth. My lasting impressions of him were a man who is passionate, driven and desperate to succeed with Forest. He stated he’d never walked out of a contract, and wasn’t about to start – so the only way he’s leaving is if pushed – he maintained his relationship with the powers-that-be is good, so that seems unlikely too. For those fans hoping for a public tantrum – and I think there were a fair few there, sadly – they might’ve been disappointed. Certainly the higher echelons of the Forest command could take a leaf from Billy’s book – his willingness to face a room of fans and take questions is brilliant and I take my hat off to him for doing so, however I fear a minority element might well have dissuaded him from doing it again in the future – and probably consequently scuppered the admittedly small chance that Mark Arthur might have made an appearance at a future event. All in all an illuminating evening – like any football fan and wannabe journalist a part of me was hoping he’d dish the dirt and gossip, but ultimately I’m pleased that Billy conducted himself with dignity and professionalism in what he would and wouldn’t disclose. Of course, it got a bit repetitive at times, which is where it could’ve been hosted a little more graciously – but fair play to Darren Fletcher, he does generally do a pretty good job! Hopefully that covers things – given that I’ve already smashed 1600 words as I type I certainly think I’ve waffled on for long enough, but obviously if you were these and think I’ve missed anything then please make use of the comments – or of course should you wish to make comment on the things I did recall! Thanks for the précis, NFFC. Not having attended either night it looks as though Billy had been asked to reign it in a bit. I would merely remind everyone of something he said last time (I am paraphrasing): Don’t believe half of what you hear and nothing of what you read in the papers. nffc – thanks for the ‘report’. I sincerely hope that Billy himself reads your words (or is given a summary) and therefore will realise that there are many strong supporters of him, the club and broadly, everything that is being done at ‘our’ club to return it to the position that we all believe we should be in. I strongly believe that if he is continued to be given decent backing, that Billy is capable of delivering against our expectations. I have met him a couple of times and his commitment, passion and perhaps ‘bloody-mindedness’ to succeed is clearly evident. I hope he stays with us for many years! 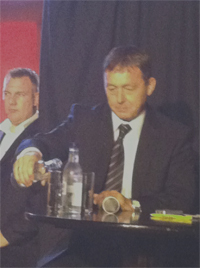 I thoroughly enjoyed last nights evening with Billy Davies. I think we all may have been a little naive in thinking he was going to reveal ‘board matters’. The vast majority respected his position, although may have become a little frustrated at the responses. I must admit I had hoped Billy would dish some dirt, but did I honestly go there with the belief that he would? No. There were a couple of hecklers who made Billy a little uncomforatble. I personally felt that Billy could have been a little more tactical in the way he declined to answer certain questions. Responses offered such as “No comment” and a stubborn “Don’t know” were always going to tip some restless punters over the edge and result in them voicing their frustration direct to Billy. That said, I thought Billy put on a good show. The pleasing thing I took away was that he is commited to Nottingham Forest and getting us up. Although we need more than one. A signing will change the whole atmoshpere and there will be a massive ‘buzz’ around Nottingham Forest. Can’t wait for the season to kick off YOU REDS!! As i have said previously,i wonder if our problems are financial? Perhaps Mr Doughty has no more money to give? Tough times affect everyone, and he needs to find around £7 million a year to keep the club going BEFORE signing and paying players. Perhaps the championship is our level for now? Some of the banking/economic reforms that have been touted over the last two years would hit him pretty hard too.